Samsung has said it is targeting the youth market, at the launch of its S7 and S7 edge – the latest additions to its popular Galaxy premium handset range. The manufacturer believes that experience around the phone will be the critical differentiator in appealing to this market. Rather than making a significant departure in terms of form factor, Samsung has kept with the design template of the S6 and S6 range. 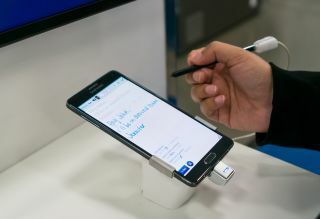 Samsung said it had conducted research into the youth market and had found that the main driver behind this demographic buying a particular handset related to how the phone interacted with other devices. With this goal in mind, the brand has made Virtual Reality a key component of its strategy, and has also announced the Samsung Gear 360 camera. The 360 camera device allows users to capture their own VR footage, which can be viewed on a Samsung phone using the brand’s VR headset. Speaking at the launch of the product, Rory O’Neill, VP of brand and product marketing at Samsung Electronics Europe, said: ‘We found that for people under 25, the main reason for them choosing their phones was the way in which they interacted with their other devices. ‘We’re super-excited about the role of virtual reality. Virtual reality will be the way in which we collect, store and share memories in the future. Facebook has spoken about the evolution of Facebook from text to photo and through to VR. Well that’s why we work on virtual reality, because that’s how we believe people will use that technology in the future. We think that user-generated content will really fuel the growth of virtual reality, because there is only one thing that people want to see in virtual reality and that, of course is themselves. Commenting on the UK smartphone space, O’Neill said that despite the high levels of market penetration there remained opportunities for the manufacturer to win customers: ‘The smartphone market is now a mature market for the UK, more than 51% of the population now have a smartphone. We weren’t in that position a year ago – we certainly weren’t in that position two years ago. ‘We have to think very differently about the smartphone market compared with how we did even two years ago. The good news is that the smartphone market is still very fast moving compared with other consumer goods – people will still change their smartphone quite regularly. So we’ve still got a good opportunity to reach people with great experiences.